Change can be a good thing. In the spring of 2010, when I watched the Marlins at Spring Training in Jupiter, the core group of Florida players had remained largely unchanged for the past few seasons. After the few immaculate days on the Treasure Coast, I had an autograph from almost every player on the Marlins’ 25-man roster. But when the front office of the Marlins decided to rebuild starting in July of 2010, I decided not to get too attached to the incoming players. 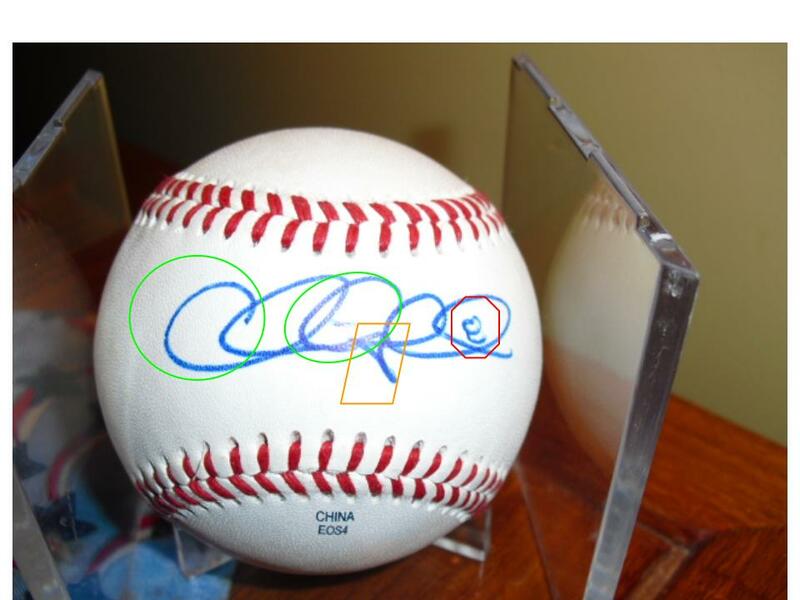 So for now, I only have the signatures of the 2009 and 2010 players for analysis. That has not proved to be much of a problem, though, as Chris Coghlan and Jorge Cantú have consistent, recognizable signatures worth sharing. As I said, change can be a good thing, but it is generally not when it comes to autographs. Acceptable changes occur when a player has a large crowd to sign for in a short period of time, in which case he will shorthand more of his name. But for the most part, signatures are easier to identify more impressive when a player can repeat the same style time and again. I have highlighted a few points of interest in his autograph. At first glance, the signature looks like a collection of loops, after all C, G, and L are loopy letters in cursive. But after a closer look, his two capital letters are identifiable. The green circles show his two capital ‘C’s. The orange parallelogram outlines the only instance in the name where Coghlan forms an individual lowercase letter–in this case a ‘g.’ This habit is consistent among all his signatures. Finally, the 8 is sleekly tucked inside the last loop. 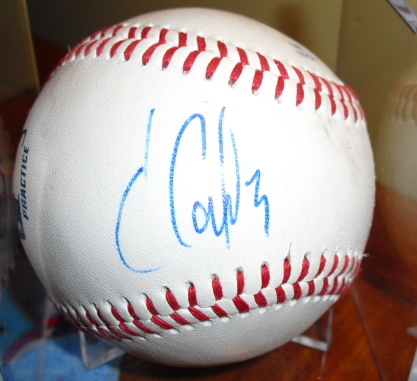 For the most part, Coghlan’s autograph is shorthand; however it is not full of scribbles and arbitrary lines that take up space. Rather, the rounded letters provide a more pleasing viewing experience. First of all, the hook on it is not going right, not left. Also, the bar that traditionally rests perpendicular to the stalk of the ‘J’ is straight up-and-down, connecting at a wide angle to the top of the letter, which has been hooked around to the right. The autograph is an art, there is no right and wrong. Thus, Cantu’s signature is as fine as any, and variation makes any hobby more enjoyable. In a not-so-smooth transition: The offseason of baseball is upon us, leaving me with few interesting topics to discuss, and I exhausted the majority of those in my three posts last weekend. So I hope you enjoyed partaking in the dry nature that is looking at scribbles on round, 5 oz. would-be-projectiles, which are much more interesting to observe when they are travelling 120 mph, 494 feet into the Colorado night.